Robinson Anton Thread is the leading embroidery thread. Robinson Anton Thread is perfect for any machine and superior to old fashioned spools. Robinson-Anton Thread is also smooth running and has a bright, highly lustrous sheen. Robinson Anton 50wt Quilting Thread- Robinson-Anton 50wt Mercerized 100% Egyptian Cotton. For Machine or Hand Use. The Market's Leading Thread. 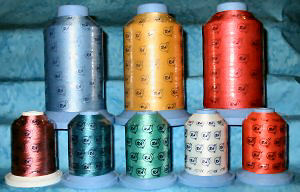 Robinson Anton J Metallic Thread- Highest Grade of Metallic Thread Available. Designed for Embroidery, Embellishment and all other Decorative Applications. Runs Exceptionally Well with all Embroidery Threads on all Embroidery Machines. Robinson Anton Moonglow Thread- Recharges With Available Light. Brighten up those special projects, the possibilities are endless. Robinson Anton 40wt Rayon Variegated Thread- 40wt Super Strength Rayon Thread from Robinson-Anton Thread is the market's leading rayon thread. Robinson-Anton Thread - Super Strength Rayon is smooth and easy running, with a bright high-luster sheen. Robinson Anton 40wt Polyester Thread- 40wt Super Bright Polyester Thread from Robinson-Anton Thread is the market's leading thread. Ideal for any type machine and superior to traditional sewing spools, Robinson-Anton Polyester Thread is bleach resistant and a true value. Robinson Anton 40wt Rayon Thread- 40wt Super Strength Rayon Thread from Robinson-Anton Thread is the market's leading rayon thread. Robinson-Anton Thread - Super Strength Rayon is smooth and easy running, with a bright high-luster sheen.